Customs authorities have referred family members of Korean Air Chairman Cho Yang-ho to state prosecutors on smuggling charges, an official said Thursday. 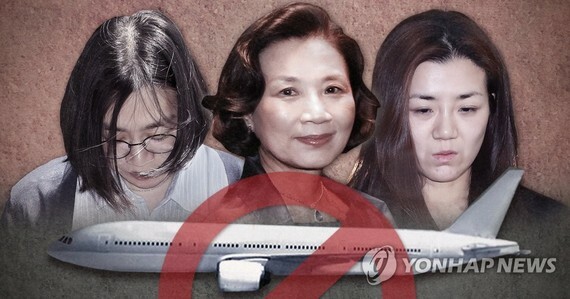 It the latest bout of negative attention to hit South Korea's largest national flag carrier, Cho's wife Lee Myung-hee and their two daughters -- Hyun-min and Hyun-ah -- are accused of smuggling a wide range of goods worth 150 million won (US$134,000) on 260 occasions between April 2009 and May this year, said Ryoo Ha-sun, an official at the spokesman's office of the Korea Customs Service. The three are suspected of having smuggled goods such as clothes, bags, shoes and fruits, as well as rings, disguising them as goods being brought in for the airline. The Korea Customs Service referred the three to the Incheon District Prosecutors' Office for possible indictment, Lee said, adding that Chairman Cho was not included. Smuggling is an offense that carries a maximum sentence of five years in prison and fines up to 10 times the duties evaded. The family members are also accused of having misstated to the authorities that Korean Air imported furniture, bathtubs and other goods worth 570 million won on 30 occasions between January 2013 and March 2017. The move came after the customs office launched probes into alleged smuggling by Cho's family members. The Korean Air owning family has faced a series of bad publicity since early this year when the chairman's youngest daughter, Hyun-min, created a controversy by throwing water in the face of an ad agency manager during a meeting. Hyun-min is the younger sister of Hyun-ah, who gained global notoriety for the "nut rage" incident in 2014. At the time, she forced a plane back to the boarding gate at New York's John F. Kennedy International Airport because she was upset with the way her nuts were served -- in an unopened bag instead of on a plate. The Korean Air chief has offered a public apology and dismissed his two daughters from all of their corporate posts. Customs authorities have referred family members of Korean Air Chairman Cho Yang-ho to state prosecutors on smuggling charges an official said Thursday.